Mountain goats are confused with Dall sheep, but goats have black horns, and there are no Dall sheep in Southeast Alaska. Mountain goats are more tolerant of the wetter coastal climates than Dall sheep. Mountain goats inhabit rugged, mountainous habitats in western North America. In Alaska, mountain goats occur in coastal regions in southeastern and south-central Alaska. Mountain goats were not described in the scientific literature until 1816 and remain one of the least-studied large mammals in North America. They are sometimes confused with Dall sheep, but sheep are not typically found in coastal Alaska (generally prefering drier country). Nonetheless, in some small areas of Alaska mountain goats and Dall’s sheep occur on the same mountains (i.e., Kenai Mtns–Cooper Landing, Turnagain Arm–Penguin Ck., Knik Glacier, Wrangell/St. Elias–McColl Ridge). The mountain goat (Oreamnos americanus) is the single North American representative of a unique group of mountain ungulates called the Rupicaprinae, or “rock goats.” They are characterized by having relatively short horns and a fondness for living in rugged terrain. Mountain goats are one of two species of all-white, hoofed, large mammals found in Alaska. Mountain goats are easily distinguishable from Dall sheep by their black horns. These creatures are well adapted for extreme winter conditions and have a long, shaggy winter coat. A crest of long, erect hair up to eight or more inches in length runs along the spine, on the rump, and over the shoulders and neck. Long hairs on the legs give the appearance that the goat is wearing pantaloons. Mountain goats begin shedding their winter coat in June, with adult males and sub-adults shedding-out before females. By July, their soft, sleek summer coat is grown in. When the first winter snows dust the high country in mid-October, mountain goats have fully grown their winter coats again. The appearance of both sexes is much alike except that males are about 40% larger than females and have differently shaped horns. Adult female goats weigh about 180 pounds, with males averaging about 280 pounds (in late-summer); prime-aged males often weigh more than 300 pounds, with the largest male yet weighed topping 385 pounds. The horns of an average adult female are equal in length to those of an average adult male but are more slender and bend back more sharply at the tip. Mountain goat hooves are specially designed for climbing in steep, rock, and slippery terrain. A close-up look reveals a hard keratinous sheath and a soft embedded pad that enable goats to gain purchase on the smallest of granite cracks while simultaneously gripping maximum surface area. The breeding season for mountain goats occurs between late October and early December. Billies (males) may travel considerable distances in search of receptive females (nannies). Mountain goats have a polygynous mating systems, meaning that males will breed with multiple females but not vice versa. Typically, prime-aged males (5-10 years old) do most of the breeding, with some battling among males causing occasional horn-inflicted puncture wounds. Adult males usually separate themselves from larger nanny-kid nursery groups except for during the rut. They may form small bachelor groups, especially in summer. Females, on the other hand, tend to stay in groups along with kids and immature animals. This behavior is particularly evident during mid-summer when large nursery bands form. Usually a single kid is born in mid-late May after a gestation period of approximately 180 days. Twinning occurs rarely. Nannies seek out rugged, isolated sites prior to giving birth but soon join other nannies with newborn kids to form nursery groups. Kids remain with their mothers until the next breeding season and often for some years beyond. Interestingly, mountain goats will not give birth until they are 4 years of age; this is quite old compared to female moose, black-tailed deer, and caribou. Mountain goats may live up to 18 years, but most live less than 12. Mountain goats are both grazing and browsing animals depending on the particular habitat and season of the year. They normally summer in high alpine meadows where they graze on sedges, forbs, and low-growing shrubs. As winter advances, feeding habits generally shift to browsing. Blueberry, hemlock, and lichen can be important winter diet items, but feeding habits in winter center on availability. Mountain goats occupy remote habitat and are therefore the least studied large mammal in North America. The mountain goat’s range is restricted to the steep and broken mountain ranges of northwestern North America, from the northern Cascade and Rocky mountains to Southcentral Alaska. 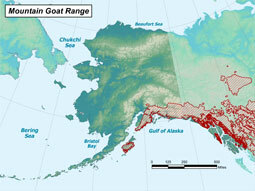 In Alaska, mountain goats occur throughout the southeast Panhandle with their range continuing north and west along the coastal mountains to Cook Inlet. In Southcentral Alaska they are generally confined to the Chugach and Wrangell mountains, although small numbers of goats have been documented in the Talkeetna Mountains. Mountain goats have also been introduced to non-native range on Kodiak and Baranof Islands where populations have expanded, on Chichagof Island where the transplant apparently failed, and most recently on Revillagigedo Island where goats are now firmly established. Mountain goats on Baranof Island are an interesting case study because recent genetic data indicate that mountain goats may have occurred on the island since the last ice age in a "cryptic refugia" and the 1923 transplant was an augmentation to the existing population rather than a true introduction. Goats in coastal areas exhibit altitudinal migrations from alpine summer ranges to winter ranges at or below tree line, typically in old-growth forest habitats. In more interior areas, mountain goats will winter on windswept ridges as long as forage areas remain uncovered by snow. Mountain goat populations are highly sensitive to severe winter conditions and human harvest, particularly when harvest rates of female mountain goats are high. In addition, mountain goat populations are often small and geographically isolated. As a result, mountain goat population trends throughout Alaska vary considerably from place to place and from year to year. Overall, there are estimated to be 24,000–33,500 mountain goats in Alaska. A majority occur in southeast Alaska (13,500–20,000) though the Cordova area (3800–4400), Kenai Peninsula (3300–4750) and Kodiak Island (1700–2000) also considerable numbers of mountain goats. Peripheral areas such as the Wrangell Mountains (700) and northern Chugach mountains (Anchorage area = 600–700, Knik Glacier = 150–160, NE Chugach = 200) have smaller populations. The Talkeetna Mountains has a very small, isolated populations of 30–40 animals. Over the 10-yr period between 2000-2009 an average of 485 mountain goats were per year. The highest harvest occurred in southeast Alaska (162) and Kodiak island (129). A substantial amount of annual harvest also occurs on the Kenai peninsula (78) and the Cordova/PWS area (64). Other areas such as the Gulf Coast (20) and northern Chugach mountains (38) have relatively low harvest, due to small populations or geographic isolation. 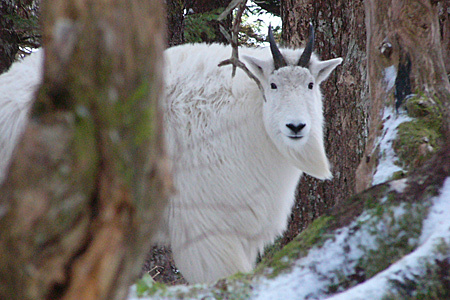 Winter snowfall is one of the most important factors influencing mountain goat (and all ungulates) populations in Alaska. High snowfall can result in substantially reduced survival of adult mountain goats. Since adult survival is the most important influencing population dynamics, severe winters can result in significant population declines. In the Lynn Canal area, detailed research has documented a 45% decline during a 5-year period dominated by several severe winters. Since mountain goats have relatively low reproductive rates, it often takes several years for populations to rebound once winter conditions moderate. Harvest of female mountain goats represents another threat to mountain goat populations. In most places in Alaska females can be legally harvested through the practice is strongly discouraged. Harvest of females can be sustainable is low proportions are harvested but nonetheless reduced harvest opportunity for harvest of males. If female harvest rates are high, population declines can occur and has occurred in places such as the Kenai peninsula and Baranof island. Timber harvest in low elevation, forested mountain goat winter range is relatively limited in Alaska. Nonetheless, the practice has occurred in the past and can effect mountain goat populations by reducing the amount of habitat available for mountain goats during the critical winter season. Relative to other wildlife species, mountain goats are particularly sensitive to industrial disturbance activities such as helicopter overflights and blasting. In coastal Alaska, helicopter tourism (flight-seeing in summer, helicopter skiing in winter) is an increasingly popular activity and management agencies are particularly concerned about its effects of mountain goat populations. Industrial activities such as mining, road construction and hydroelectric development also have the potential to have detrimental effects on mountain goat populations. Throughout Southeast Alaska, along coastal mountains and into Southcentral. Sedges, forbs, low-growing shrubs, blueberries, hemlock, and lichen. Single kid is most common; twinning is rare. Mountain goats are sure-footed climbers and have specially adapted hooves for climbing in rough, slippery terrain. Mountain goats are among the most charismatic species and inhabit one of the most spectacular landscapes on earth.